It often happens when you least expect it. Out of the blue you receive a call from an executive search firm, wanting to know if you might have an interest in a position they are trying to fill for a client. The opportunity seems promising, but you do not know what to expect. What does the process entail? How long will it take? What will the search firm expect from you? Most important, what are your rights and obligations during the process? As a potential search candidate, you are entitled to ask these questions and to have them answered. In retained executive search, consultants endeavor to provide qualified candidates for clients who wish to fill senior-level positions. Although contractual obligations exist only between the search firm and client, search consultants also build professional and ethical relationships with candidates, whom they may remain in contact with over a period of years. Theron International subscribes to the Association of Executive Search Consultants (AESC) “Candidates Bill of Rights” & this document is taken from its online resources & we subscribe to their code of ethics that states that these relationships should be characterized by honesty, objectivity, accuracy and respect for confidentiality. We strict adhere to this code. It is important to remember that you do not become a search candidate until the consultant has conducted an initial evaluation of your suitability for the position and you have expressed an interest in it. If either of these two criteria are missing, you cannot be considered a candidate for the position. However, even if the position about which you are being contacted is not right for you at the present time, you may still benefit from conversations with search consultants by being kept up to date with the market for your skills and experience. Candidates not selected on one search may be selected on another. Based on his or her understanding of the position and the client’s needs, the search consultant should give you an honest appraisal of where you seem to fit the opportunity and where you do not seem to fit. If at any point in the process the client decides not to proceed with your candidacy, the consultant should provide as complete an explanation of the client’s decision as possible. The search consultant and the client should always do their best to be on the same wavelength in terms of the information they present to you. Keep in mind, however, that while the search consultant represents the client organization, they do not have complete control over the client’s communication with you during the process. If changes occur that contradict the information given to you by the consultant, you should ask for clarification. If the client decides to hire you to fill the position, you have arrived at one of the most important stages of the search process: negotiation of your employment agreement. This can involve highly sensitive issues in which the search consultant can play a crucial role of intermediary to ensure open and effective communication between client and candidate. Use this honest broker channel of communication to candidly express any concerns or special requirements that you may have on terms and conditions. If your candidacy does not result in a hire, most consultants will want to keep you in their pool of candidates for future assignments. They may contact you from time to time to maintain the relationship and keep you appraised of any upcoming assignments. They may also use you as a resource to help identify candidates for assignments that are not a good fit for you. If you developed a good relationship with the search consultant, you may want to take your own steps to maintain the relationship as well. Be honest. Under no circumstances should you inflate your resume, misrepresent your work history or "hold some cards back." Also, be genuine about your interest (or lack of) in the position. Complete and accurate disclosure by the candidate is an essential element in the search process. Above all, do not think you have a "done deal" just because you develop a close relationship with the search consultant. Remember that the consultant’s job is to present several qualified candidates to the client, and it is the client who makes the ultimate decision. 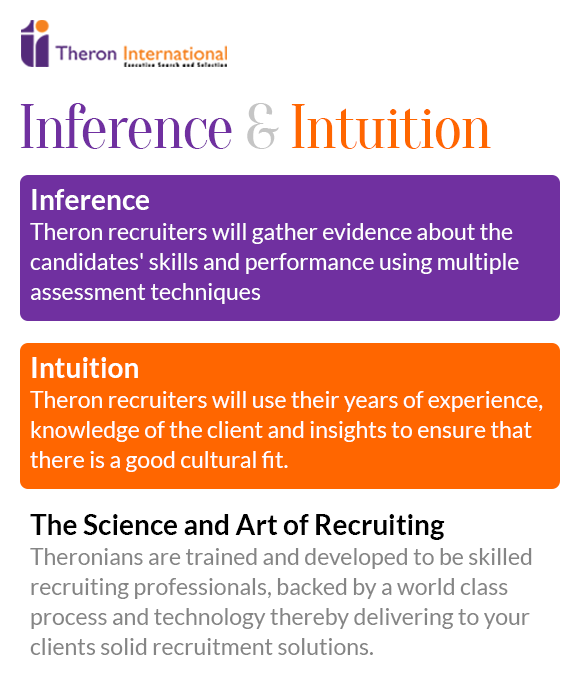 How do you get on the “radar screen” of Theron International? The best way is to register with www.theroninternational.com . Doing so will raise your visibility internally & you will be assured of confidentiality. The more you know about the executive search process, the better you can position yourself should you become an executive search candidate. In the meantime, remember that the most successful executive searches involve those where you, the search consultant and the client know your rights and obligations within the search process and adhere to the highest standards of professional and ethical conduct.